This week's theme means no pictures with girls and women in it. Only boys and men. I'm sure it is in honor of Father's Day. 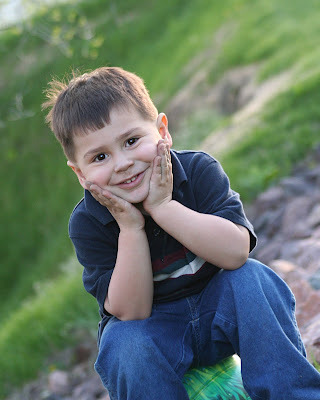 Here is a picture of my son, Tristan, when I took the kids outside on a nice evening. This pose is very rare and, in fact, lasted long enough for me to take it. Then he was off running again. This picture was taken at the Colorado Renaissance Festival. These guys were hilarious. You can't see it in the picture, but the back of their vests have pretzels embroidered on them. If you're curious to see what it looks like, I have a picture in this post. Well, that's my entry for this week. Check out other boyish and manly faces at iheartfaces.blogspot.com. your sweet boy is a cutie ~ but that last picture is a riot! Great entry! Love your entries! Tristan is such a handsome fella :) The adult entry is hilarious!!! Great captures! Great shots! My entry is here. awww love the little hands on the face!! Love your photos! Our Medieval Faire is coming up in a few weeks(Great Lakes Medieval Faire), and your picture is making me very excited for it! such a cutie boy! love the shot! What a precious little boy! Both pictures fit the theme perfectly! Great job!